India faces a choice: be a cog in the wheel of the US’ Asia-Pacific strategy or be a wheel by itself with a dynamics of its own. The choice is going to be rather easy for the Indian policymakers to make. Merriam-Webster defines ‘lynch pin’ as a “locking pin inserted crosswise (as through the end of an axle or shaft)” – as something that “serves to hold together parts or elements that exist or function as a unit.” In essence, lynch pin – Americans call it ‘linch pin’ – is a person or thing that “holds something together: the most important part of a complex situation or system”, as Learner’s Dictionary explains. “America is at a turning point. After a decade of war, we are developing a new defense strategy – a central feature of which is a ‘rebalancing’ toward the Asia-Pacific region. In particular, we will expand our military partnerships and our presence in the arc of extending from the Western Pacific and East Asia into the Indian Ocean region and South Asia. Visiting American dignitaries habitually use eye-catching idiom as part of public diplomacy to catch the attention of their Indian audience. But by any benchmark, Panetta raised the bar of rhetoric. The Indian pundits and think tankers are sure to purr over the word ‘linch pin’ for weeks and months to come. What Panetta implied was that India holds the pride of place in the US regional strategies in Asia. Ironically, what he probably didn’t mean and ended up inadvertently was to imply also that without India playing ball, the US’ military strategy of ‘pivot’ to Asia, which the Pentagon unveiled in January, might unravel. In either case, the reference is clearly to India’s growing military prowess and capability, the ‘inter-operability’ between the US and Indian forces, and common strategies and military doctrines. Panetta paid no attention to India’s status as ‘emerging power’ in the global economy. Plainly put, what Panetta implied was that for any US containment strategy toward China to work, India should move alongside in lockstep. This proposition puts an enormous burden on the Indian policymakers. From available accounts of Panetta’s interactions in New Delhi, his interlocutors refused to react. Some well-informed media sources with good access to the Indian defence establishment, however, maintain that A. K. Antony would have conveyed to Panetta Delhi’s reservations regarding the US’ ‘rebalancing’ strategy. In sum, Indians has resorted to strategic ambiguity. This is just as well and could only have been expected. Traditionally, India has eschewed any bloc mentality. To name India as ‘linch pin’ in someone else’s strategy was not probably the smartest thing to do. In response, Krishna vowed that the Sino-Indian relationship is one of the most important bilateral relationships in the world. These are indeed big statements – coming from Li, who is widely regarded as the likely nominee to replace Wen Jiabao, and from Krishna who would have known that Panetta met with the Indian prime minister Manmohan Singh just the previous day. It might seem a battle for India’s soul has begun, but actually that isn’t the case. The Indian policymakers do not need America’s South Asia hands to educate them in Sinology. On the contrary, they have a mind of their own and are clear about India’s priorities. They are also skilled enough in international diplomacy to leverage advantages for India in a fluid international situation. Conceivably, Panetta’s visit may have created a “win-win” situation for India in the geopolitics of the Asia-Pacific region. Even as Panetta was in town, Dr. Singh took a very important strategy meeting in Delhi on Wednesday with India’s economic czars to deliberate how to revive India’s growth story. Dr. Singh’s recipe is that infrastructure development is a key part of the Indian strategy to boost investment and growth in these “turbulent” times. Dr. Singh has set an investment target of rupees 2,000,000 million (approx. $ 40 billion) in the current financial year alone to spur the economy to preform at a higher trajectory of nine percent. This is where China comes in. Beijing is signaling readiness to boost investments in India’s infrastructure and telecom projects. The head of China Development Bank Chen Yuan is on record that the financial institution, which is already involved in $4.4 billion worth projects in India, is keen to expand its engagement in India. Clearly, Washington chose an awkward moment to announce its “rebalancing” to Asia. India is going to be cautious about the US enterprise to rally the Asian nations and with the hope of arresting the decline in its influence and to counter the cascading influence of China. India will be chary of identifying with such a plank with overt or covert “anti-China” orientation. Apart from the centrality that India traditionally attaches to strategic autonomy in the core areas of its foreign and security policies, one compelling factor in the near term is going to be the imperatives of India’s economic development. India cannot and will not offend China at a juncture when China could help it with its economic development. Besides, the Sino-Indian relationship is steadily improving. This was much in evidence from Krishna’s remarks following the meeting with LI in Beijing yesterday and with his Chinese counterpart Yang Jiechi today. On its part, China also seems to appreciate the directions of India’s policies with regard to the US’ ‘rebalancing’ of military assets to the Asia-Pacific. The balance sheet of the recent years shows that Indian diplomats have handled the interplay of the vectors of competition and cooperation in the Sino-Indian relationship exceedingly well – almost optimally. 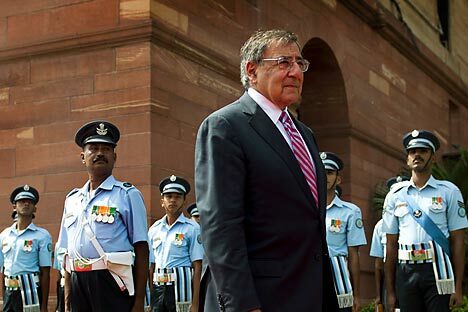 On the whole, therefore, Panetta’s visit to Delhi works to India’s advantage. Washington has, evidently, worn on its sleeve the privileged status it accords to India as a partner. When a superpower does that on its own volition, it doesn’t do India any harm, to say the least. Again, Panetta repeatedly stressed the US’ keenness to participate in India’s military modernization program. He also took note more than once that the US will be willing to liberalize the regime for transfer of military technology to India and to initiate the necessary steps in this direction so that from a transactional relationship of selling weapons to India, the two countries can graduate into an advanced form of defence cooperation in terms of joint design and co-production of weapons. This is something that India also has been pressing for. The forthcoming US-India Strategic Dialogue in Washington on June 13 is sure to deliberate on this topic further. Evidently, India also stands to gain from the intensification of military exercises with the US. Last year alone, over 50 military exercises were held. Panetta spoke highly of the increase in the scope and complexity of these military exercises. In geopolitical terms, what stands out in the final reckoning as Panetta left Delhi today is the alacrity with which India has transferred the “synergy” from this latest US-India discourse to Krishna who attended the Shanghai Cooperation Organization’s [SCO] summit in Beijing. Addressing the SCO summit meeting on Thursday, Krishna said, "The most important security challenge we face today relates to Afghanistan, which lies in the heart of Asia and is a bridge, connecting not just Central and South Asia but also Eurasia and the Middle East. The SCO provides a promising alternative regional platform to discuss the rapidly changing Afghan situation." Things have never been spelt out so directly and with such clarity by India in regard of the SCO’s role in Afghanistan. And it comes at a juncture when the SCO’s new motto is that the initiative for finding solution to the problems of the region should invariably lie with the countries of the region.